You know how in the movies people use cockroaches as spies? Like, oh don’t worry… no one will notice this conspicuously huge bug crawling around. And even if they do, the satellite we glued to its back is super subtle. No one will think it’s fishy. Plus he’s totally trained, so he’ll get eavesdroppy on the bad guys rather than just crawling around inside a f***ing wall like a normal roach. Well – the scientists of the iBionics lab at North Carolina State University are turning this magical dream into a reality! They’ve figured out how to hack the movements of the adorably named Madagascar Hissing cockroach. How sweet. To do it, they glue microchip “backpacks” to their outer shells. These are battery powered units that can be equipped with a mini solar panel for recharging on long missions. The business end of the backpack has two wires that are threaded into the tips of each antennae and glued in place. The wires can be electronically operated to gently tug either antenna, literally creating a set of cockroach reins. Roaches normally use their antennae as sensorimotor organs to detect their environment, so a tiny bend in the antennae will make them turn side to side. 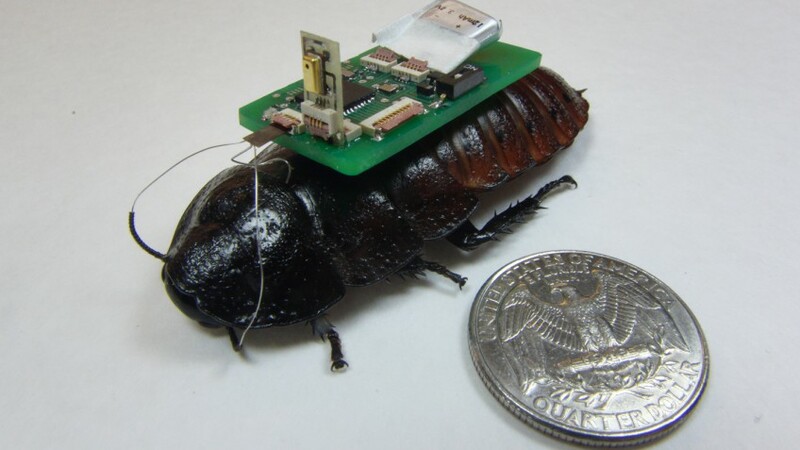 Therefore, by using a remote control to gently tug the appropriate antennae, the user is able to guide the roach – with AMAZING accuracy. Seriously, I was skeptical when I read about it, but this video shut me up real quick. They’ve also developed an electric fence that can corral several biobots within a region, allowing them to stay together and work as a group. The fence is basically just sends an electrical impulse to the backpack when the roach comes too close, gently turning it away with the antennae system. The goal is to make an army of biobots to explore and map disaster sites, like searching earthquake rubble to locate survivors. They even put together a directional microphone system for the backpacks that can detect voices and tell the operator what direction they came from. It’s pretty elegant in it’s simplicity, isn’t it? Heh. Grad school is the worst.